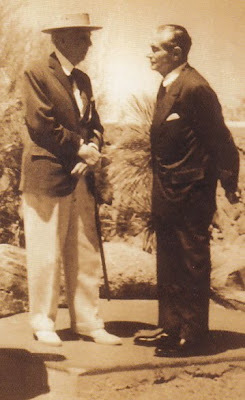 Frank Lloyd Wright & Edgar Kaufmann, Sr. There have been reams of documentation and exposition about Frank Lloyd Wright’s Fallingwater. I can understand how it captures the imagination of many people, but it has never held much thrall for me. 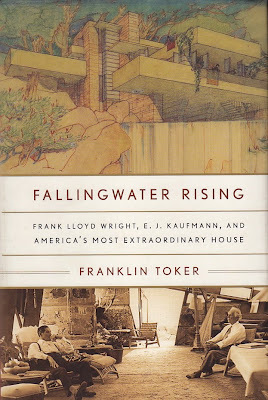 In 2003, Franklin Toker published one of the best biographies of a house in recent memory and the house was Fallingwater. Fallingwater Rising documents the design and building of the house often thought of as the most famous house of the twentieth century. It documents the family drama of the Kaufmann family who built the house and the enigmatic character of Frank Lloyd Wright. And perhaps most importantly, it chronicles the desire of man to tame the untameable at any cost. In 1905 Wright took a trip to Japan that provided the spark for Fallingwater. When Wright returned he had in his possession dozens of postcards of waterfalls. 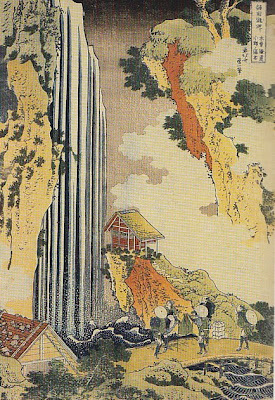 At some point he acquired a print by Hokusai, View of Ono Falls. Wright became obsessed with building a house that cantilevered over a waterfall. The most famous house of the twentieth century had its close-up, its biography and it even had its portrait painted. 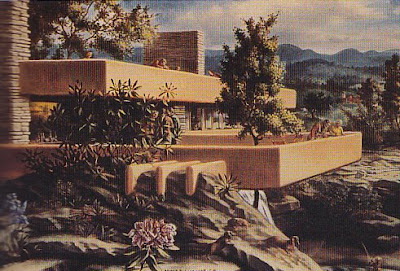 Peter Blume was commissioned by the Kaufmanns to paint Fallingwater. The artist hid the first painting, House At Falling Water. When the small oil finally saw the light of day, it had been dated, 1938-1968. The next painting by Blume was entitled, The Rock. 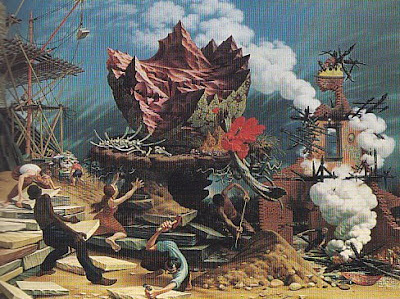 It was more in keeping with Blume’s love of magical realism and appears to be an allegory of the building of Fallingwater. Blume never spoke about his thoughts on the painting. Edgar Kaufmann, Sr. adored the work and kept it with him in Pittsburgh and Palm Springs until his death, when the painting was sent to the Art Institute of Chicago. Neither painting eve hung at Fallingwater. I suppose I never had a great affinity for Frank Lloyd Wright because he never seemed to care for kitchens. My ideal house would be an enormous kitchen with at least 2 stoves, an even more enormous two-story library, and a bathroom with a shower that had no enclosure. My interest in re-reading Fallingwater Rising arose because of a cookbook. 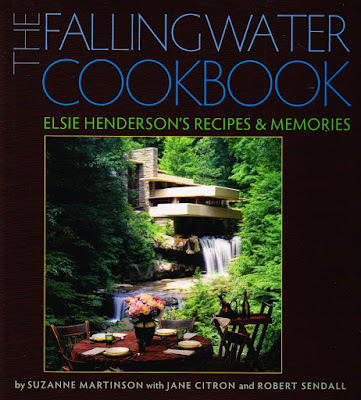 For Christmas I received a book written by the Kaufmann’s former cook at Fallingwater, Elsie Henderson. Generally, I am not overly enamored of cookbooks that want to tell me someone’s life story. I want the recipes and photos of the food and a minimum of exposition on the author’s life. The Fallingwater Cookbook was a pleasant exception. Henderson’s memories of both cooking in a “Wright Kitchen” and of the Kaufmann family are fascination. The issues of class and race are dealt with in direct and comfortable manner. After the recent news about Harry Ried, it is clear that America is still unable find the language to deal with race and its inevitable companion, class. Elsie Henderson answered an ad in the paper and interviewed in the Kaufmann’s penthouse, so arriving at Fallingwater was a shock. On her first day in 1947 as she worked in the kitchen she heard laughter and looked out the widow. In fact, the Kaufmanns paid for twice-a-year parties for the servants and Edgar Sr. was always anxious to see what the staff thought of his wines. Wright put a bit more thought into the kitchen at Fallingwater, but it was still modest. The room was 15 x 12 with a Frigidaire refrigerator, a coal-burning Aga stove, a Formica-topped table and four chairs, a bank of yellow metal St. Charles cabinets, and a stainless steel double sink. 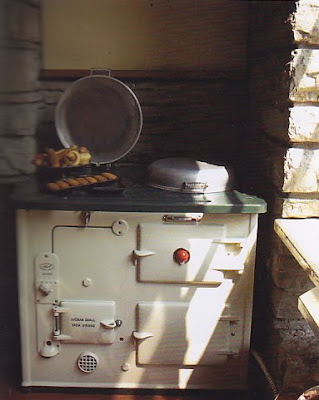 The coal-burning Aga made baking a problem and wanting to enjoy Henderson’s baked goods, Edgar, Sr. gave her carte blanche to buy a new stove to facilitate her baking. Here is Elsie Henderson’s recipe for pecan shortbreads. In the bowl of an electric mixer, cream the butter and add confectioner’s sugar. Sift flour with the baking powder and salt. Stir into the butter-sugar mixture. Work pecans into the dough with your hands. On a lightly floured board, roll out the dough into a rectangle 1/3 inch thick. With a sharp knife, cut the dough into 2 1/2 inch squares. Place on an ungreased cookie sheet. Bake in the preheated oven for 20 to 25 minutes. The shortbread will be mostly white with lightly browned edges. If you are enamoured of both architecture and cooking, The Fallingwater Cookbook is a great addition to your library, even if it is only a single story. For another selection from The Fallingwater Cookbook check out this post at Cookbook Of The Day. give us this marvellous insight into the Kaufmann household. This is a marvellous post. And thank You, too! I generally am of the opinion that FLW was highly over-rated -but fallingwater is a masterpiece: but must be seen in person to enjoy. It cannot be enjoyed or fully understood through photographs. The kitchen is quite wonderful -unfortuantely closed to the public now -but it has THE view from the house of the surrounding -unlike many homes of the wealthy that featured kitchens in the basement, rear of the house or simply with no windows. Even a comfortable nook was later built for the servants to hang out in with another priceless view (currently the hang-out room for docents while not working). ArchitectDesign: I so agree with your assesment of FLW. I am so jealous that you have seen the kitchen at Fallingwater. It is terribly funny to think a house where the cook has one of the best views, especially of the skinny dipping. Very interesting post. I am an avid fan of Frank Lloyd Wright, and I have a question for you about your reference to Fallingwater in the post, specifically his 1905 visit to Japan. You mention that while on this trip, he acquired the print "View Of The Falls" by Hokusai, and many postcards of waterfalls. As a result, you claim that he became obsessed with the notion of building a house that cantilevered over a waterfall, ultimately leading to the design and construction of Fallingwater. In all my studies of Wright and Fallingwater, I have not encountered this theory before. Would you mind letting me know what reference materials you may have consulted that led you to this conclusion? I would be most interested to learn more about this theory regarding Fallingwater, and would greatly appreciate any input you can offer. Thanks so much. What a fascinating account of a classic with an entirely new twist -- a kitchen with a view for the hired help. I think the intricacies, the challenges, the never-before-imagined result and the dedication, diligence and devotion of the key players, notably Wright and the Kaufmann's, Senior and Junior, have created a legend, deservedly or not, that will long endure. Completely agree with AD on the majesty of the place as being most evident in its presence. As one who grew up in that part of the world, I had the opportunity to visit it several times over the years and it simply doesn't translate in any other form. Anonymous: The info about the Japan trip came from Toker's book. Evidently, FLW had tried on several occasions to find a site with an appropriate waterfall to build over. I believe he even tried to have a waterfall "constructed" on a building site. He never found the right client or the right space until he found the Kaufmanns.